Arya, meet Jaqen H'ghar. Jaqen H'ghar, meet Arya Stark. Jaqen is such a cool character, for reasons that will be revealed in forthcoming episodes. For now, though, the traveling party headed for the Wall receives a most unwelcome visit from some Gold Cloaks. They're pretty far away from King's Landing, and Arya fears that they're there for her. Surprise—they have a warrant for Gendry. Yoren is most displeased by this intrusion and threatens to cut the artery of one of the guards if they don't go skedaddle immediately. Tyrion returns to his private quarters to find Shae with Varys. The Spider is far from stupid and knows she shouldn't be in King's Landing and that Lord Tywin would be terribly upset if he found out. So, as usual, Varys possesses dangerous information, and Tyrion lets him know that he's on to him. Alton Lannister arrives with Robb's peace terms, and Cersei promptly rips up the parchment. So much for peace! About how you fart when you die (Lord Tywin should file that bit of info away). Sam shoos Ghost away after the direwolf scares Gilly, one of Craster's wives/daughters. Sam later finds Jon and tells him that they have to take Gilly with them. She's pregnant with Craster's baby and is afraid of what will happen if she has a boy. Jon dismisses the idea because even if they didn't have to worry about Craster killing them, it's just not possible for Gilly and her child to travel with the Night's Watch as they go even further beyond the Wall. A horse returns—with Rakharo's head in the saddlebag. Jorah says that a rival khal is most likely to blame. Judging by her freakout, it looks like Irri, one of Daenerys's handmaidens, had an extra special place in her heart for dearly departed Rakharo. Theon is sailing to the home he hasn't seen in years and is expecting a HUGE homecoming. Ha. Ros is still upset about what the City Watch did to King Robert's baby. Littlefinger, ever sensitive to these types of matters, advises Ros to take a day off to find her happy face again and then put it on and get back to earning him money. Tyrion is having dinner with Slynt, and who is that squiring around? Why, it's Podrick Payne! 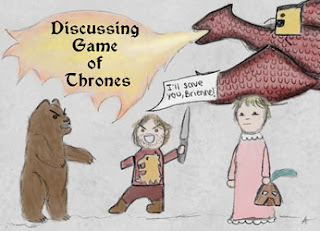 Anyway, the conversation is pretty civil until Tyrion brings up the baby who was killed under Slynt's watch. Tyrion further goes on to accuse him of being bought even before Ned tried to buy his loyalty. Slynt is sent to the Wall and none other than Bronn now commands the City Watch. Arya learns that Gendry spoke to both Jon Arryn and her father before they died; both inquired about his mother. Gendry tells her that he knows she's a girl; with her cover already shredded to pieces, Arya goes all truthful and reveals she's a Stark. Gendry gets jokingly self-conscious about being in the presence of a highborn lady. Theon lands in the Iron Islands, dressed all snazzy like, and there's NO ONE there to meet him. A woman offers to take him to the castle by horse, and Theon spends the trip working the Greyjoy charm and then some. His father's greeting, however, is super frosty. Balon Greyjoy makes fun of Theon's fancy clothes and accessories and scoffs at Robb's proposal to send ships to help fight his war. Oh, and the woman Theon hitched a ride with turns out to be his sister, Yara. AWKWARD. Davos is trying to convince pirate Salladhor Saan to fight for Stannis with promises of oodles of gold for the taking in King's Landing. Cersei is fuming over Slynt's dismissal. Tyrion asks her if murdering Robert's bastards was her idea, and she replies that it was Joffrey's. Tyrion makes a joke about the word that's literally flying around the realm about his siblings' relationship, and Cersei strikes back by telling him that he killed her mother. Not "their" mother, but her mother. The scene really illustrates how deep Cersei's hatred for her youngest brother runs. Stannis is frustrated that he can't match the numbers of Renly's army. Stannis and Melisandre then mistake the war room table at Dragonstone for a bed. And that story arc is just going to get even more disturbing! Jon sees Craster skulking off into the night and follows him, only to find out what happens to the sons that are born to the old man. Said old man catches Jon spying and socks him in the face. Jaqen H'ghar was an interesting character and I liked him a lot. I have a sneaking suspicion that Jaqen and Syrio Forel are one and the same person. After all Syrio was a dancing master from Braavos and I believe it was he who first spoke of the faceless men to Arya. At least that is kind of my hope that they are the same person, and despite everything, Arya still has someone looking over her. And Janos Slynt getting the boot was too funny! Tyrion came back to Kings Landing and promptly began shitting all over Cersei's plans! I LOVE Jaqen H'ghar! I love Syrio, too, and I think it's a very plausible theory that they're the same person. We never found out exactly what happened to Syrio, and that's enough of an open door for me to believe he could very well still be alive, lol. Tyrion was so awesome as Hand of the King! It's too bad no one really appreciated all that he did for the realm. OMG, I thought so too! Tyrion did so MUCH for Kings Landing trying to defend it only to get pushed aside and basically shitted on in the end. That really bugged me that no one was willing to give him the credit he deserved. It was hard work trying to keep KL from falling apart as a result of his idiot nephew's rule. And then almost everyone thinks he killed his idiot nephew! Tywin got most of the credit for saving KL from Stannis, but really, if Tyrion hadn't done all of the planning that he did, Stannis would have won for sure.